The process by which some dinosaurs became birds millions of years ago was accompanied by profound changes in the upper part of the skull of those reptiles, according to a study published this Monday in the journal Nature. The research led by experts from Yale University (USA) also provides new clues on how skulls evolve according to the transformations that pass through the brains, an unexplored area until now in this field. "During the transition from dinosaur to bird, the skull is transformed enormously and the brain is enlarged. We were surprised that no one had directly studied this idea," explained Bhart-Anjan Singh Bhullar, one of the study authors. According to this approach, the anterior (prosencephalon) and middle (mesencephalon) brains are related or "developmentally connected" to the frontal and parietal bones of the skull, the expert said. Although previous studies have addressed the general connection between the brain and skull, it was not clear until now that there are relationships between specific regions of the brain and individual elements of the upper skull. This, the Yale scientists said, has led to opposing theories about the developmental processes of the skull. In this sense, Bhullar and his colleagues did not simply analyze the evolution of the brain and cranial morphology of the dinosaurs closest to the birds, but addressed that of the entire lineage involved in the transition from reptiles to birds. They found that most reptile brains and skulls were markedly similar to each other, while those of dinosaurs and evolutionarily closer birds were different. "We found a clear relationship between the frontal bones and the prosencephalon and between the parietal bones and the midbrain," said Bhullar, whose team analyzed embryos from lizards, caimans and birds for this research. The experts suggest that this relationship "exists in all vertebrates with bony skulls" and points to a "deep developmental connection" between the brain and the upper skull. "This implies that the brain produces molecular signals that force the skeleton to form around it," said Bhullar, who acknowledged that "we know relatively little about the precise nature of this pattern. Ultimately, he concluded, one of the conclusions of this study is that "evolution is simpler and more elegant than it seems. ​Baptized with the poetic name of "a giant thunder at dawn", Ledumahadi Mafube in sesotho language, experts have described a new species of sauropod dinosaur, found in South Africa, where it lived 200 million years ago and was a close relative and ancestor of the brontosaurus. The remains found belong to an adult specimen, about 14 years old, and may have weighed about 12,000 kilos, according to a study published by Current Biology. The new dinosaur walked predominantly on all fours, thus anticipating, during the Jurassic, the displacement system that would later perfect the brontosaurus and his fellow humans. One of the authors of the study, Jonah Choiniere of the University of Witwatersrand in Johannesburg, pointed out that this finding shows that "200 million years ago, these animals had become the largest vertebrates that have walked the Earth. Choiniere said, in a statement, that understanding the biology of these animals using only fossil records "is extremely difficult," so they used other methods to discover some of their characteristics. In this way, to determine if he walked on two legs, like his predecessors, or on four, they developed a method using measurements of current animals and measuring the thickness of the dinosaur's extremities to infer its weight and how many legs would have held that weight. Thus, the results suggest not only that the Ledumahadi mafube was quadruped, but that many other early sauropods were "experienced" in the art of four-legged walking, which had arisen from species that moved only with their hind legs. Choiniere said that the evolution of sauropods is not as simple as we thought. In addition, according to the expert, these findings show that millions of years before the tyrannosaurus or velocirpator appeared in the northern hemisphere, there was already "a prosperous ecosystem of dinosaurs in South Africa," where "12-ton giants like the Ledumahadi, tiny canivores like the megapnosaurus, and the first mammals lived. This giant frog was able to eat dinosaurs. 68 million years ago there was a monumental frog the size of an inflatable beach ball with a bite so powerful that it was capable of hunting and devouring small dinosaurs back in the Late Cretaceous. It is Beelzebufo ampinga and is undoubtedly the largest frog known to date, according to the study published by a team of scientists from California Polytechnic State University in Pomona (California) and the University of Adelaide (Australia) in the journal Scientific Reports. Using their similarities to today's Ceratophrys frogs, scientists have detailed the past of this bulky amphibian, which was much larger than any frog we can see today. Also known as 'devil frog', Beelzebufo ampinga was more than 40 centimeters long and weighed about 4.5 kilograms. She was dressed in a powerful armor (ampinga) and a herculean, wide jaw. Scientists believe it must have been the largest frog ever seen. 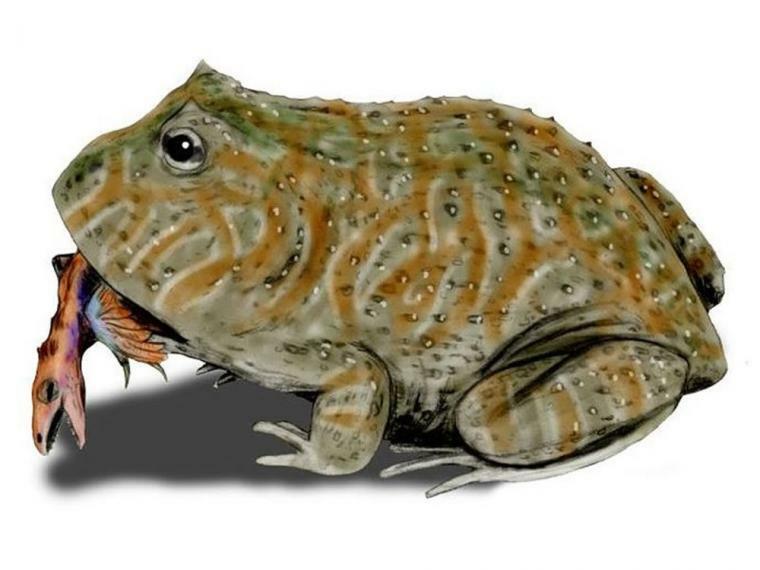 Similar to today's Ceratophrys frogs (commonly known as Pac-Man frogs because of their round body and wide mouth, similar to the character of the well-known video game), experts used knowledge about them to determine the strength of the bite of the ancient Beelzebufo. They used a custom-made force transducer with two leather-covered plates. When the frog bites on the plates, the force of the bite can be accurately detected. A modern Ceratophrys frog, with a head width of 4.5 centimeters, has a bite force of 30 Newtons, or approximately 3 kilograms. This allows the frog, once it has captured its prey with its sticky tongue, to secure the food firmly in motion between its powerful jaws, squeezing it and making it impossible for it to escape. Its name means: beelze = devil, in Greek, bufo = toad, in Latin and ampinga = shield. ​"Unlike the vast majority of frogs that have weak jaws and habitually consume small prey, horned frogs ambush animals as large as themselves - including other frogs, snakes and rodents, and their powerful jaws play a critical role in grabbing and dominating the prey," comments Marc Jones, co-author of the paper. The scaling method used to determine the bite force of these frogs, linking the bite force to body and head size, is also consistent with the results found for other animals, including fish, reptiles, and rodents. Thus, by extrapolating the bite force results to the size of Beelzebufo's mouth, about 15.4 centimeters wide, the scientists identified a bite force of up to 2,200 Newtons (about 224 kg). That is, the force of their bite would be comparable to that of today's tortoises. A new method of genetic reconstruction creates a chicken embryo with a muzzle and a palate similar to that of the velociraptor. Have you ever wondered if it would be possible to bring dinosaurs back to life? After the recent release of Jurassic World's sequel, T-REX and Velociraptor are back on everyone's lips. More than 11,000 species of modern birds, from owls and falcons to robins and charcoal burners, are the direct descendants of dinosaurs. The whole evolutionary process after its extinction is now history. To understand the historical context, we must take into account the discovery of the Archaeopteryx in 1864, whose existence dates back to the Upper Jurassic. Steven Spielberg's shadow is elongated. And so is his influence. Without his whimsical conception of dinosaurs, the current vision of this species of reptile would be very different and perhaps only more forgettable. Starting from the fact that they looked more like birds than big lizards, the director did not allow any scientific basis to ruin the emotion of this great spectacle on the big screen. That imagery that King Midas of Hollywood captured with great success in "Jurassic Park", initiating a cinematographic franchise that still exists to this day, perpetuated a mistaken concept about dinosaurs, which were neither so dangerous nor so fast. In fact, a study by the Leipzig Biodiversity Research Centre has shown that, in reality, the Tyrannosaurus Rex, disproportionately large in almost all films, was not so fast. It could not exceed 19 kilometres per hour. Nor would I try to persecute Laura Dern or Sam Neill, because "T-Rex was not a predator at all but an opportunist, who would probably eat anets of animals that were dead that were alive and, without a doubt, would not persecute them," Jack Horner explains in an interview with ABC. Much more lethal, however, were the velociraptores, "who were at the top of the food chain because they were the real lions of the jungle, because they had the ability to mount their prey and start eating it. "Spielberg wanted dinosaurs to have a certain degree of terror. We know that dinosaurs wouldn't be as scary as what we see in the movies, they wouldn't go into houses or knock down cars. 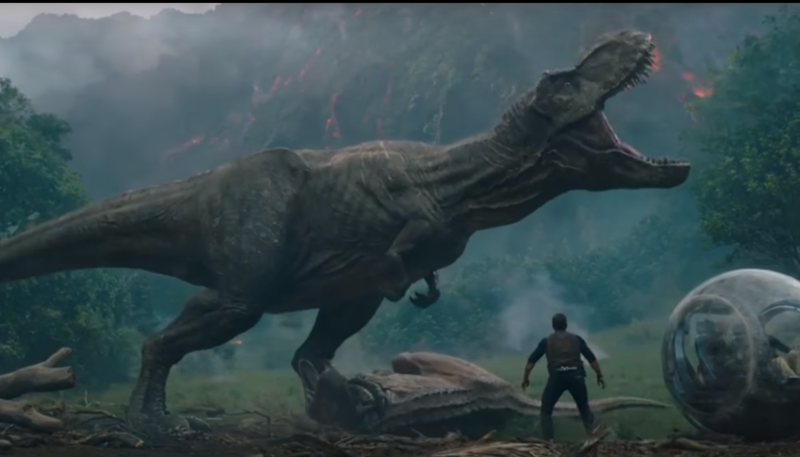 They do a lot of things in movies that they obviously wouldn't do in real life," explains the paleontologist, who spent a quarter of a century working for the profitable Jurassic franchise. "The film was made with the intention of being scary, but the dinosaurs were ordinary animals," admits the expert who inspired Alan Grant's character in "Jurassic Park. The expert, who is currently trying to "make a dinosaur using genetic engineering through a bird; make a reverse engineering with a bird to return to its ancestral form of dinosaur," now reviews his work advising the film director, where his collaboration was to "make the dinosaurs as precise as possible. Obviously he didn't succeed, or at least not as he would have liked. ​"We knew that dinosaurs had feathers and were more colorful but, as this was not scary enough, Spielberg decided to show it in a different way," says Horner, who, although he gave in to the director's demands after a discussion, nuances, not without a certain irony: "It is true that we know that they had more color than in the tapes, but only males ... and in the movies are all females. That terrifying roar is also the product of fiction, which preferred that guttural sound rather than one more similar to that of the birds, their "direct descendants". In fact, there is no scientific evidence to prove the existence of flying dinosaurs. Although there were flying reptiles, they were called pterosaurs. 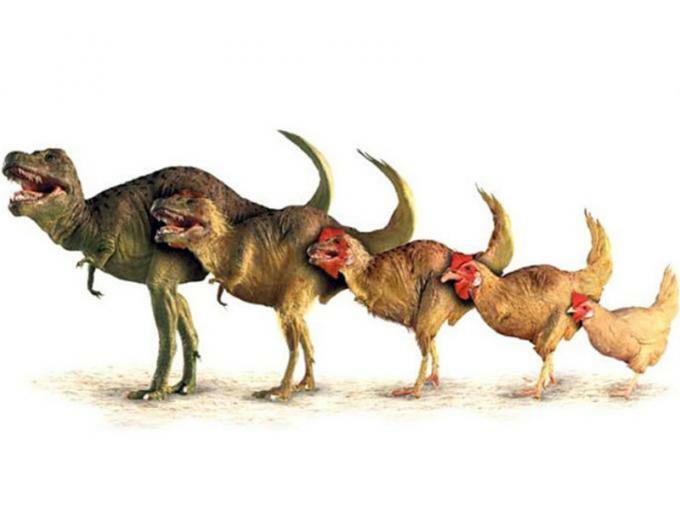 "Birds developed empty feathers, clavicles and bones after dinosaurs. The only thing the birds developed before and not the dinosaurs was the ability to fly," reveals Jack Horner.